This page shows the main stages in the history of the Nexa Center. A 1-page description of the Nexa Center is available in PDF. March – The Nexa Center co-director Juan Carlos De Martin activated the course “Tecnologie Digitali e Società" (Digital Technologies and Society) in the context of the Master’s degree programmes in Computer Engineering and Electronic Engineering at Politecnico di Torino. The course aims at providing the students with a critical reflection on the mutual influence between society and information technologies and on the forces shaping the latter, with an interdisciplinary approach. December – The 10th Nexa Conference (December 18, 2018) took place. We discussed the role of urban digital commons in shaping the future governance of our cities, in the context of two ongoing projects: the Digital Open Urban Twin at the Future Urban Legacy Lab, and the H2020 project DECODE. June - This year a new Fellow, Lara Merla, Ph.D. candidate in Law and Institutions at the University of Turin, as well as a new Faculty Associate, Simone Arcagni, Associate professor at University of Palermo (Cinema and Media), will join the Nexa community. They all have already collaborated with the Nexa Center on several topics including computer vision, big data, privacy and protection of user data. 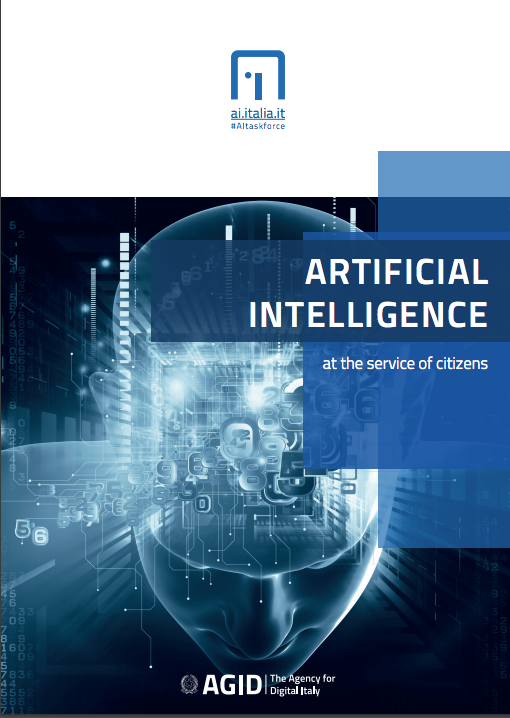 March – This first version of the AI White Paper was realesed by AgID (Agency for Digital Italy) and it was available for public consultation until March 12th 2018. The aim of this document is to analyse the impact of Artificial Intelligence (AI) on our society and, specifically, how these technologies can be used by Public Administration (PA) to improve services for citizens and businesses. Nexa Center has collaborated to the writing of the White Paper. December – The 9th annual Nexa Conference for Internet & Society (December 18, 2017) focused on the ethical and governance problems arised from the coming of the Artificial Intelligence. Several sector experts who come from the scientific and humanistic academic fields have been involved, but also businessmen, Public Administration and media professionals. June - This year will join the Nexa Community one new Faculty Fellow, Antonio Casilli, associate professor at the Paris Institute of Technology and research fellow at the School for Advanced Studies in Social Sciences (EHESS) will join the Nexa Community, as well as three new Fellows: Lorenzo Canova, who studied Management Engineering at Politecnico di Torino, Fabio Nascimbeni, Assistant Professor at the Universidad Internacional de La Rioja and Guido Noto La Diega, tenured lecturer in law at the Northumbria University. May – On 16 May, the Nexa Center, in collaboration with the University of Torino, organized in Brussels the round table “IOT & Circular Economy: this side of paradise” with representatives of the European Commission, industry, academia and international organizations. The program is available here. February –Juan Carlos De Martin, co-director of the Nexa Center, completed his work on University in the digitale age which he had started in 2011 during a stay at Harvard University. The book, titled: "Università futura. Tra democrazia e bit" (Future University. Between democracy and bit), was published by Codice edizioni in February 2017 (under a Creative Commons License). The work examines the role of Universities in the light of five global challenges for the 21st century - environmental, technological, economic, geopolitical and democratic - and articulates an idea of University which is at the same time old and new. December – The eighth annual Nexa Conference for Internet & Society (December 2, 2016) focuses on "Internet of Things: Hell ora Paradise? ", comparing benefits and risks in digital technology, envisaging good or bad scenarios. September –The 27th of September the IT and Society Lab promoted by Cini, under the supervision of Professor Juan Carlos De Martin, was presented at the House of Deputies in the presence of President Laura Boldrini. The Lab is an opportunity to enhance the understanding – wide, interdisciplinary and fundamental – of digital technology, an understanding which is strictly linked to the international debate, but which is also focused on specific problems and opportunities of the Italian context. July – This year will join the Nexa Community one new Faculty Fellow, Enrico Donaggio, Professor of Philosophy of History at the Università degli Studi Torino, and two new Fellows: Davide Allavena, a master student of Physics at the Università di Pavia, e Antonio Langiu, a student of Computer Engineering at the Politecnico di Torino, collaborating with the Nexa Center on several topics including net neutrality, open data, privacy and reuse of user data in the context of the apps. March – The Nexa Center Fellows Federico Morando and Alessio Melandri found Synapta, spin off of the Nexa Center that creates advanced services based on Linked Data technologies for companies and public administrations. The Nexa Center Research Fellow Giuseppe Futia wins the "Best Tool For Multi-lingual Journalists" prize in occasion of the #newsHACK 2016 competition organized by the BBC Connected Studio and the BBC News Labs. During the hackathon Giuseppe has exploited tools that use the same technology of the TellMeFirst software. December – The seventh annual Nexa Conference for Internet & Society (December 4, 2015) focuses on "Fedeltà e servitù digitali", featuring two keynotes by Gianmarco Veruggio and Bruce Sterling. November – The Nexa Center is partner of Lumen, the project of the Berkman Center at the Harvard University on the network transparency. June – The first edition of the third level course "Topics in Internet & Society Interdisciplinary Studies", organized by the Nexa Center and encompassing several Nexa Trustees as lecturers, is held at Politecnico di Torino. Three new Fellows join the Nexa community for 2015/2016: Marco Torchiano (as Faculty Fellow), Arturo Filastò, and Alessio Melandri. May – In collaboration with the Italian Chamber of Deputies and the Italian Senate, the Nexa Center completes and publishes the first version of a study on the use of Open Data within the Italian Parliament ("Gli open data in ambito parlamentare", in Italian). The Nexa Center organizes the conference entitled "The legal challenges of service robotics: safety, privacy law, rights and responsibilities" at the University of Turin, linked to a research project on the law of service robots, in cooperation with Telecom Italia. January – The Nexa Center organizes and hosts NNTools2015, a multidisciplinary workshop on network-measurement methodologies and tools applied to net neutrality. October – On October 2, 2014 the Global Network of Interdisciplinary Internet & Society Research Centers hosts an academic symposium on “The Evolution of the Internet Governance Ecosystem” as part of an ongoing Network of Centers (NoC) events series on the future of Internet governance. In accordance with the foundational principles, the Alexander von Humboldt Institute for Internet and Society (HIIG) hands over the administrative leadership of the Network to the Nexa Center for Internet & Society. July – A public consultation on the Italian translation of the 4.0 version of the Creative Commons licenses is opened. In the previous months, the Nexa Center contributed to the drafting of the 4.0 licenses - officially released November 25th, 2013 - and translated in Italian the Legal Code, in cooperation with the CC Headquarters Legal Staff. 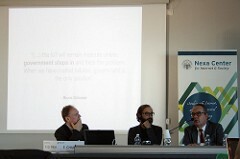 June – The Nexa Center organizes three international seminars at the Politecnico di Torino, involving the Nexa Trustees Luciano Floridi (University of Oxford), Brett Frischmann (Yeshiva University), and Jean Claude Guédon (Université de Montréal). May – The paper entitled "Breaking public administrations’ data silos: the case of Open-DAI, and a comparison between open data platforms" (Raimondo Iemma, Michele Osella, Federico Morando) earns the "Best Paper Award" of the International Conference for E-Democracy and Open Government 2014 (CeDEM14), Danube University Krems. March – Simone Basso, Neubot project leader, successfully defends his doctoral thesis, becoming the first official PhD produced by the Nexa Center. The Nexa Center presents the report "#socialUniversity", the first quantitative research on the use of social media by Italian universities, with a focus on Facebook and Twitter. November – The fifth annual Nexa Conference for Internet & Society (November 30, 2013) focuses on "Internet & Democracy". The conference also features CCIT2013, a session reporting on the state of Creative Commons in Italy. The Nexa Center announces that Professor Luciano Floridi (Oxford University) and Professor Maria Chiara Pievatolo (University of Pisa) have joined the Nexa Board of Trustees. June – The Nexa Center announces that Prof. Brett Frischmann (Yeshiva University), Prof. Lucie Guibault (University of Amsterdam) and Bruce Sterling (author and journalist) have joined the Nexa Board of Trustees. The Nexa Center announces also the new Fellows for 2013 / 2014 who contribute to the activities of the Center, and two Faculty Associates: Giorgio Ventre (University of Napoli Federico II), Andrea Cairola (journalist). April – The 1st International conference on Internet Science - Internet, Interdisciplinarity & Innovation organized in Brussels (April 10-11, 2013) under the aegis of the European Commission, by the EINS project, the FP7 European Network of Excellence in Internet Science. March – On March 8, the Public Domain Day takes place in Turin, organized by the Library System of the Politecnico di Torino with the collaboration of the Nexa Center. Published the source code of TellMeFirst, a tool for classifying and enriching textual documents via Linked Open Data. 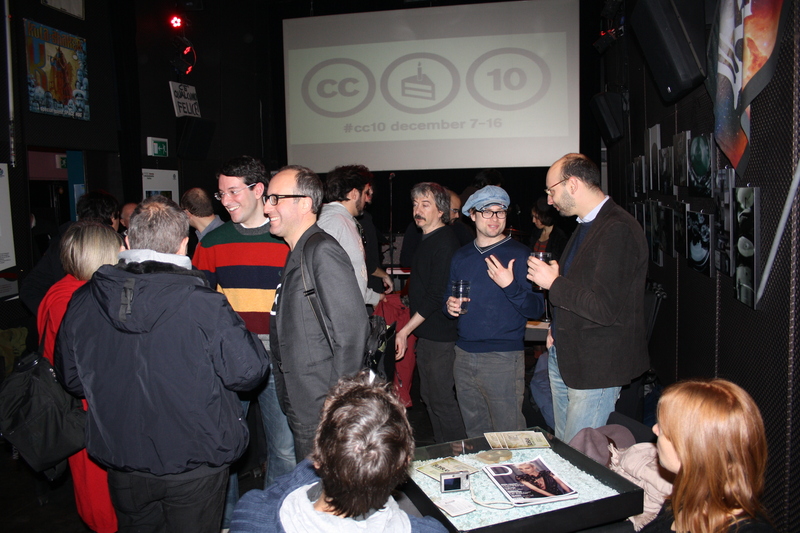 December – Celebrations for the 10 Years of the Creative Commons licenses (and eight for the Italian version). Federico Morando becomes the new public lead of Creative Commons Italia. The Nexa Center becomes part of the global Network of Internet & Society Centers (NoC), a collaborative initiative among academic institutions with a focus on interdisciplinary research on the development, social impact, policy implications, and legal issues concerning the Internet. October – The Internet Governance Forum Italia 2012 takes place in Turin under the scientific coordination of the Nexa Center and the organizational coordination of Regione Piemonte. September – The Nexa Center contributes to the agreement signed between the Italian Ministry of Heritage and Culture (MiBAC) and Wikimedia Italia concerning the "Wiki Loves Monuments" international photo competition that aims to make available on Wikipedia images related to the cultural heritage of a country. May – The Nexa Center presents "Come funziona Internet", the Italian translation of "How the Internet Works," a guide to the Network published in English by European Digital Rights (EDRi), a non-profit association based in Brussels. The series of “Nexa Lunch Seminars”, which take place the fourth Wednesday of each month starting from May 2012, is inaugurated. April - The Nexa Center announces the new Fellows for 2012 who contribute to the activities of the Center: Mauro Alovisio, Raimondo Iemma, Monica Alessia Senor, Giuseppe Vaciago. Moreover, the Nexa center announces three new members of the Board of Trustees: Urs Gasser (Harvard University), Jean-Claude Guédon (Université de Montréal), David Post (Temple University). Partnership agreement with the Internet & Society Lab at Keio University (Tokyo, Japan). The agreement provides for the development of joint research projects, seminars, conferences, courses as well as the exchange of researchers between the Nexa Center and the Internet & Society Lab. March – On March 21 at the Politecnico di Torino the first lesson of the "Rivoluzione Digitale" course is held. February – The kick-off meeting of the Open-DAI project takes place in Turin. Open-DAI (Opening Data Architectures and Infrastructures of European Public Administrations) is a project funded under the ICT Policy Support Programme as part of the Competitiveness and Innovation framework Programme (CIP) Call 2011. On February 28, the Public Domain Day is held in Torino, organized by the Library System of the Politecnico di Torino with the collaboration of the Nexa Center. January – The Neubot project is hosted at Measurement Lab, an open, distributed server platform on which researchers can deploy open source Internet measurement tools. December – The third annual Nexa Conference for Internet & Society focuses on "Open Data over an Open Network". 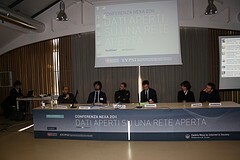 The conference also features CCIT2011, a session reporting on the state of Creative Commons in Italy. November - Proposal for a regional law on the reuse of public data with the contribution of the Nexa Center for Internet & Society and CSIG – Centro Studi di Informatica Giuridica (Ivrea). The memo is available on the EVPSI website. January – On January 22 the Public Domain Day takes place in Turin, organized by the Nexa Center, PolyMath project (Istituto Superiore Mario Boella) and the Accademia delle Scienze. The initiative is supported by the Politecnico di Torino and Communia. The Nexa Center announces the new Fellows for 2011 who contribute to the activities of the Center: Alessandro Mantelero and Claudio Artusio. Moreover, the Nexa center announces a new members of the Board of Trustees: Giulio De Petra (Informatica Trentina). The Nexa Center also supports the Italian instance of CKAN - Comprehensive Knowledge Archive Network: the first community portal attempting a collection of Italian open public datasets. 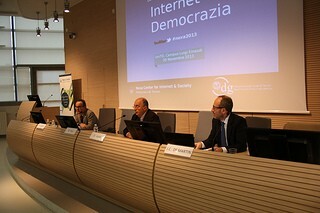 November –The second annual Nexa Conference for Internet & Society focused on freedom of expression and information online in Italy. The conference also featured CCIT2010. The first public release of the Network Neutrality Bot (Neubot) is available online. October – Free Culture Research Conference in Berlin, organized in collaboration with Communia, the European Network on the digital public domain. June – Third annual Communia conference in Turin: "University and Cyberspace - Reshaping Knowledge Institutions for the Networked Age", co-organized by the Nexa Center and Berkman Center for Internet & Society at Harvard University. March – The Nexa Center, affiliated to the Politecnico di Torino, leads the European thematic network called LAPSI project (Legal Aspects of PSI). Unlike EPSI, LAPSI's goal is to find, study and overcome the current legal obstacles to PSI reuse. November – The first annual Nexa Conference for Internet & Society presented the main research fields addressed by the Nexa Center along with experts, policy makers, professionals, enthusiasts and citizens. 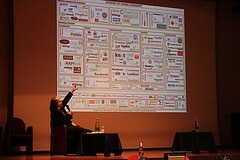 The conference also featured CCIT2009, a session reporting on the state of Creative Commons in Italy. October – Free Culture Research Workshop 2009, international seminar aimed at the multidisciplinary study and promotion of emerging trends of the Internet organized by the Berkman Center for Internet & Society with the support of the Nexa Center. June – The Nexa Center hires its first communication manager, Anna Piccitto. A more formal and structured relationship between the Nexa Center and its Fellows is defined. January – Public inauguration of the Nexa Center, featuring a keynote of prof. Stefano Rodotà. December – The Center hires its first managing director, Federico Morando, and administrative and project manager, Federica Cedriano. September – The series of “Nexa Wednesdays”, which take place the second Wednesday of each month, is inaugurated. Andrea Bairati, Regional Ministry for University, Research and Innovation and Francesco Profumo, Rector of the Politecnico di Torino, sign a collaboration agreement. July –Agreement with Regione Piemonte on a project on “Public Sector Information and digital archives: development of regional strategies for making information, contents and scientific results available online”. Budget: €500.000 over three years. September – The Nexa Center becomes the coordinator of Communia, the European Thematic Network on the Digital Public Domain. Communia is one of the pillars on which the Nexa Center built its international network and reputation. "Accordo di Programma Quadro Politecnico di Torino-Regione Piemonte" entitled "Internet & Society". This framework agreement provides the seed money to establish the Nexa Center. April – Launch of the Italian Creative Commons license suite, version 2.5. November – First annual meeting of Creative Commons Italia, featuring a keynote of Philippe Aigrain, and the first Italian Creative Commons Party. January – The second phase of the Creative Commons Italia project begins: Juan Carlos De Martin becomes the "public lead" of Creative Commons Italia and Marco Ricolfi becomes the "legal lead". December – Public launch of the Italian version of the Creative Commons license suite. November – Lawrence Lessig announces in Turin the official beginning of the work to translate and adapt the Creative Commons licenses to the Italian legal system. July – Juan Carlos De Martin and Marco Ricolfi (future founders and co-directors of the Nexa Center) meet to kick-start the working group of Creative Commons Italia. Several founding fellows of the Nexa Center will be involved in the CC Italia project, including Lorenzo Benussi, Nicola Bottero, Marco Ciurcina, Alessandro Cogo, and Massimo Travostino.